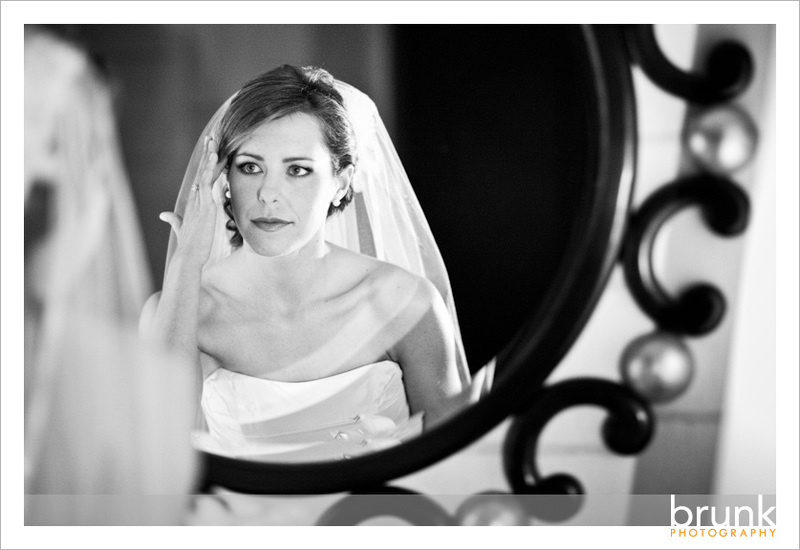 A couple of weeks ago we had the opportunity to document a beautiful wedding at the St Francis Hotel in San Francisco. It was a great place to shoot, lots of ornate details, and some really cool quiet spots for indoor portraits. We’ll start off with this shot right after Morgan got into her dress. I think she was working it for the videographer, Thomas Hughes, who was excellent, btw. The only videographer I’ve actually ever enjoyed working with. If you’re looking for wedding video, he’s about as good as it gets. I thought this was funny. We did a “first sight” moment with Morgan and Pat, and after they had seen one another, Morgan gave a little spin so he could get a better look. Some gorgeous details. The dress is from Priscilla of Boston, and the sweet peep-toes are from Kate Spade. The flower girl was adorable, and she lit up anytime the camera swung in her direction. The wedding ceremony/reception were on the 32nd floor of the St Francis and the view was spectacular. The San Francisco weather worked with us, staying crystal clear all evening. A rare sight! It was an emotional ceremony! This one’s a little “Where’s Waldo?” I admit, but I really dig it. Before we ended portrait time I wanted to check out their Honeymoon Suite, since I thought there might be some cool stuff in there to shoot. I was right! I made a beeline to this awesome reflective table. One of my favorite groom portraits ever. Here’s the reception details! The cake was among the most ornate I’ve ever seen, and was by Elegant Cheesecakes. That backdrop of the skyline didn’t hurt either! I also love that golden light pouring in before sunset. A big shout-out to Julie Briggs Dunn, the coordinator for the day who was a huge help in making sure everything went smoothly and looked good. Thanks! They had a candy bar set up, and I couldn’t resist playing with some Fireballs when it came time for the ring shot. Morgan and her Dad with their dance. We decided he has a very Paul Newman thing going on. Party Time! It ended up being quite the full dance floor, my favorite time of the day. It was so full I could barely get out there to shoot it! Thanks to my new favorite DJ Chris Mowery from Denon & Doyle. He was a total pro, keeping me in the loop for how things progressed throughout the evening, and kept the party moving all night. He’s one on my short list of DJ’s I’d feel comfortable recommending. I love this one. Morgan’s Dad did some push-ups in the dance circle, and everyone went crazy! He even caught a little air here I think. I love all the bare feet in the background too. Thanks Morgan, Pat, and Family for having us along for the ride! I hope you’re enjoying Europe you two! If you haven’t already left Paris, make sure you have some Pierre Herme for us! Seriously. It’s the most amazing stuff on Earth. I really miss living there! Sarah Neal - These photos are amazing. I mean really really amazing. I love the shot of the sun streaming through the reception room. steph, friend of morgans mom, bonnie! - All of these photos are truly amazing! They are all exceptional shots! But if I had to choose one absolute favorite, it would be of the beautiful Morgan alone in front of the window. She appears to be gazing out in peaceful contemplation of that special moment. The photographer really caught it! It is a true bridal classic. I also loved the photo of the groom reflected in the beautiful polished table. Oh I just loved ALL of them…! They made me happy just to look at them! Thanks for sharing the joy!!! Kevin Lam - Stunning images all around. One of the best sets I’ve seen in a while from anybody. Julie Briggs Dunn - Cliff, awesome work! Love the shots and it was wonderful to work with you. . . thanks for the shout out on the blog! Cliff - Thanks all for the comments all I really appreciate them! Don Gammon - Hi Cliff…Bonnie and I just wanted to say thanks so much for making a most important part of the wedding so easy. Your professional and relaxed demeanor and creative talent put everyone at ease (and as the father of the bride, that was HUGE!). The pictures posted here are fantastic…can’t wait to see the finished product. You have clearly exceeded our expectations. Richard - Wow I have just seen the most amazing wedding photos–your work is truly awesome .